It has been quiet, too quiet, for the almost three months since President Trump's former personal attorney Michael Cohen flipped, pleading guilty to campaign finance violations and other charges, saying he made payments to influence the 2016 election at the direction of a candidate for federal office, potentially delivering a legal blow to the president. As we detailed at the time, Cohen, 51, who agreed to a plea bargain with federal prosecutors earlier in the day, pleaded guilty to eight counts total, including five counts of tax evasion and one count of making a false statement to a financial institution. He also pleaded guilty to one count of making an excessive campaign contribution on Oct. 27, 2016, which is the same date Cohen finalized a payment to adult-film star Stormy Daniels as part of a nondisclosure agreement over an affair Daniels alleges she had with Trump. “Um, I need to open up a company for the transfer of all of that info regarding our friend, David, you know, so that—I’m going to do that right away,” said Mr. Cohen, according to a copy of the audio file. In an Oct. 23 interview with the Journal, Mr. Trump declined to address whether he had ever discussed the payments with Mr. Cohen during the campaign. But it appears some 'cared' as The Wall Street Journal rejuvenates those headlines this morning, reporting that Mr. Trump intervened directly to suppress stories about his alleged sexual encounters with women, according to interviews with three dozen people who have direct knowledge of the events or who have been briefed on them, as well as court papers, corporate records and other documents. 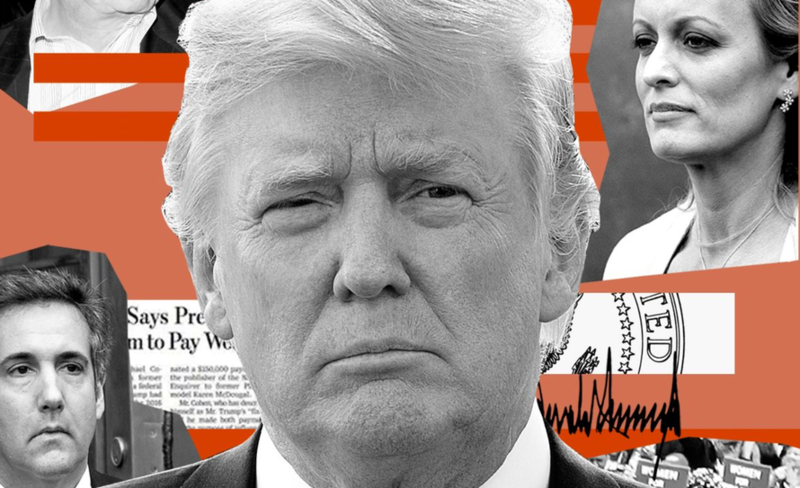 However, as it appears Cohen has offered more details of Trump's involvement, WSJ notes that taken together, the accounts refute a two-year pattern of denials by Mr. Trump, his legal team and his advisers that he was involved in payoffs to Ms. McDougal and a former adult-film star. They also raise the possibility that the president of the United States violated federal campaign-finance laws. Mr. Cohen, who left the Trump Organization to serve as the president’s personal attorney in early 2017, and other aides denied Mr. Trump played any role in the two hush-money deals when they were first reported in the Journal. Federal prosecutors in Manhattan came to believe otherwise. In August, they outlined Mr. Trump’s role -without specifically naming him - in a roughly 80-page draft federal indictment they had been preparing to file against Mr. Cohen. The unnamed campaign member or members referred to Mr. Trump, according to people familiar with the document. However, despite the excited headlines of the Journal's story, according to Richard Hasen, a law professor at University of California, Irvine, who specializes in election law, Mr. Trump’s involvement in the payments, by itself, wouldn’t mean he is guilty of federal crimes. A criminal conviction would require proof Mr. Trump willfully skirted legal prohibitions on contributions from companies or from individuals in excess of $2,700, he said. When the Justice Department accused John Edwards, a former senator from North Carolina, of using illegal campaign contributions to conceal an affair during his 2008 presidential run, he argued the money was meant to hide his mistress from his wife, not to influence the election. A jury acquitted him of one charge and deadlocked on the rest. On Thursday, the White House referred questions about Mr. Trump’s involvement in the hush deals to the president’s outside counsel Jay Sekulow, who declined to comment.